Celebratory Book Launch as Award Winning Author Celebrates 25 Years. Val Wood, A Place to Call Home. 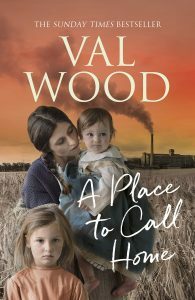 Val Wood celebrates 25 years as a published author with a special launch party at Waterstones in Hull on 29 November. For the launch of A Place to Call Home, published by Transworld, readers are invited to a special event at Waterstones in Hull. This is a momentous year for the author as it marks 25 years since the release of her first award winning title, The Hungry Tide, which won the inaugural Catherine Cookson Prize for fiction and established Val as one of the most popular authors in the UK. A Place to Call Home, is set in Hull during the 19th century and focuses on the city’s once thriving industrial area. Val says: “I grew up in Hull and celebrate the city’s history in each of my novels. Every year when I research the city I am surprised to learn something new. It has such a fascinating legacy. All you have to do is look around the city at its beautiful architecture, hidden alleyways and cobbled streets and the characters and stories they embody come to life. Hull’s influence is evident in A Place to Call Home, it explores the spirit of Hull people and theme of friendship and community without prejudice. Val was born is Castleford but now lives in Beverley. She has written 24 novels, all set in and around Hull and the East Riding. Her first novel, The Hungry Tide, published in 1993 won the Catherine Cookson Prize for Romantic Fiction. In 2012 The Val Wood Trail was launched to promote tourism and library services in Hull and the East Riding. The Val Wood Prize followed in 2013 and the international creative writing competition has continued to run annually alongside Hull Central Library. Val’s catalogue of books were named amongst the top loaned titles in UK libraries on BBC Radio 4s Open Book show and Val and her work were also the subject of a feature on BBC Radio 4’s Front Row in 2015 and the BBC documentary Books That Made Britain in 2016. In 2017 Val was awarded an honorary doctorate from The University of Hull. When she is not writing, Val supports a number of charities including Sight Support (Hull & East Yorkshire) where she holds the position of Vice President. She is also patron of Home-Start (Hull) and Butterflies Memory Loss Support Group and was a volunteer at the Talking Magazine for the Blind for 28 years. Val, who was described by BBC Radio 4 as ‘Hull’s answer to Catherine Cookson’ says: “I would never have imagined 25 years ago at my first book launch, that I would be still signing books a quarter of a century later. It’s such a thrilling experience getting my work out there and hearing from readers, many of whom have attended every year. The launch takes place at Waterstones, Jameson Street, Hull on 29 November at 5pm with further signing events continuing through the region in the following weeks. For the full signing schedule visit valeriewood.co.uk. A Place to Call Home is available to pre-order from all good booksellers. Be the first to comment on "Celebratory Book Launch as Award Winning Author Celebrates 25 Years."